Not Weather Appropriate. | Oddment! Tweak! 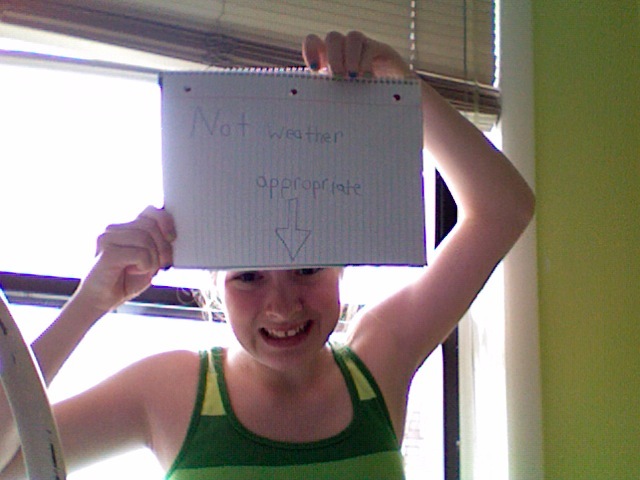 In case you can’t read the sign, it says “Not weather appropriate.” Forgive the crappy handwriting-I had to write upside-down because of Photo Booth’s messed up mirror vision. So now it looks like it’s about to flood outside, I’m wearing summer clothes, and I warned Thea (jokingly, mind you) that if anyone makes me walk to theater class, I am stabbing someone. Possibly myself, possibly them. My life is hilarious, at least to me. 🙂 Also, weather where I live is extremely messed up. Okay, I have to go! Bye! Awesome: Rain. I know I was complaining, but rain is quite pretty. Unawesome: The ungodly amount of snow we’ve been having. It’s not that I dislike snow, it would just be better if it only snowed for a month and it wasn’t cold or wet.